Disclosure: Search Press gave me a copy of this book free of charge for this review. All opinions in my review are my own and I did not receive any other compensation. They also sent me a copy to giveaway! As in all my reviews I am providing links for your ease, but receive no compensation. So just before Christmas Hazel informed me she wanted a soft doll that looked like her so she could sleep with it. Now I have all of my Christmas shopping done by Thanksgiving, so it was out of the question. 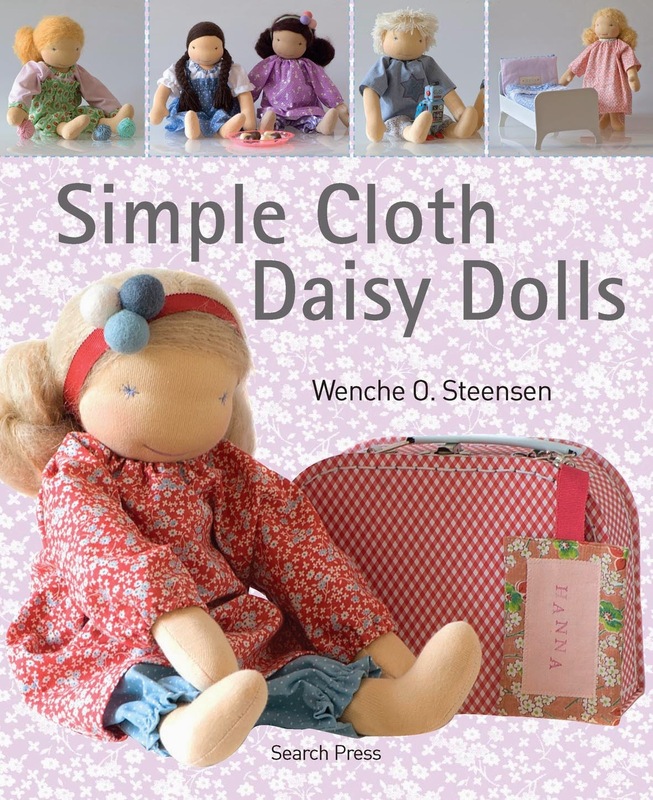 Then I received a copy of Simple Cloth Daisy Dolls by Wenche O. Steensen. 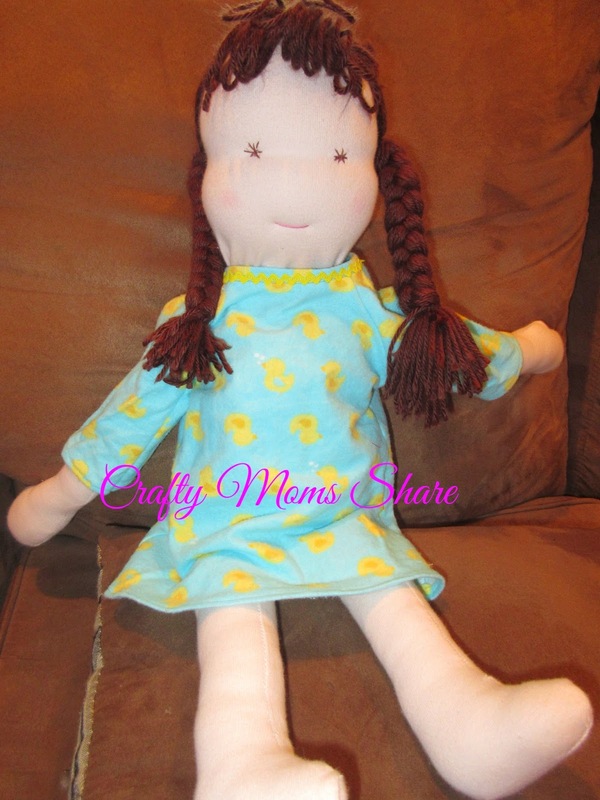 I knew I would make her a doll so I could write a proper review of the book. 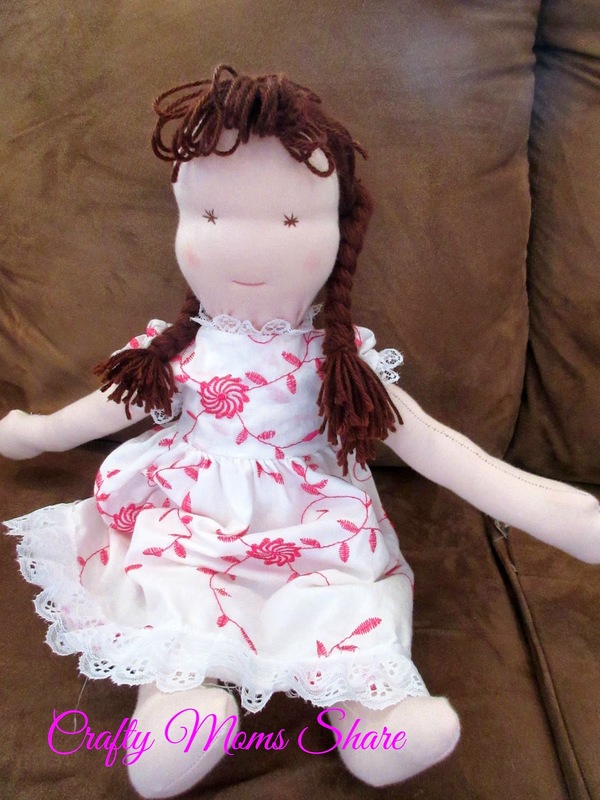 Now I made a Waldorf doll a few years ago when Hazel was still attending a Waldorf School. Hazel loves her, but does not play with her often. I used the traditional wool filling and wool yarn for hair. I also made her eyes green since my eyes change between green and blue. 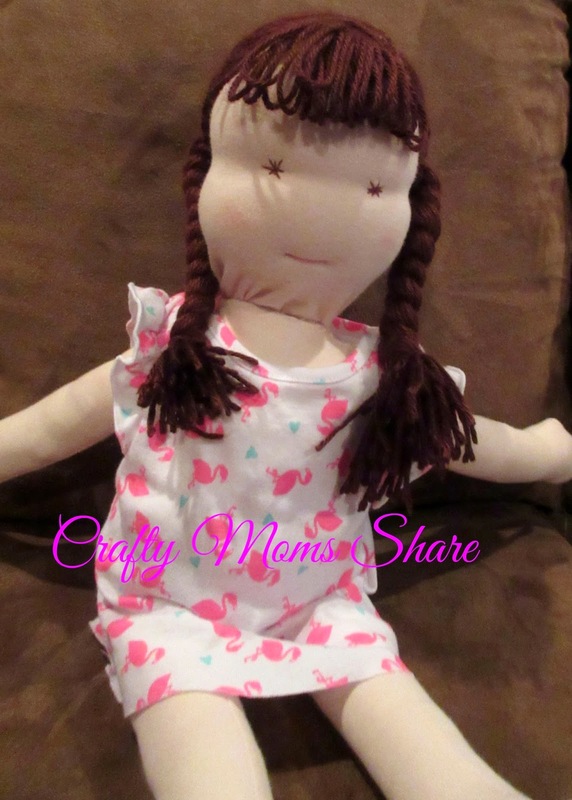 Hazel wanted a soft doll with brown hair and brown eyes. I took Hazel to Joann Fabrics to pick out a yarn for hair and floss for the eyes and lips. Since I have a wool intolerance and Hazel has very sensitive skin, we decided to not use wool on this doll. After all if the wool makes her itch like it does me, she will not want to sleep with it. Now this book explains different ways to make the doll from what I have done previously. Some of it was much easier. It also would have been easier to use the wool filling since the polyester does not hold its shape as well. I think I over stuffed the doll a bit, but my last one has trouble keeping pants on because she needs more stuffing. 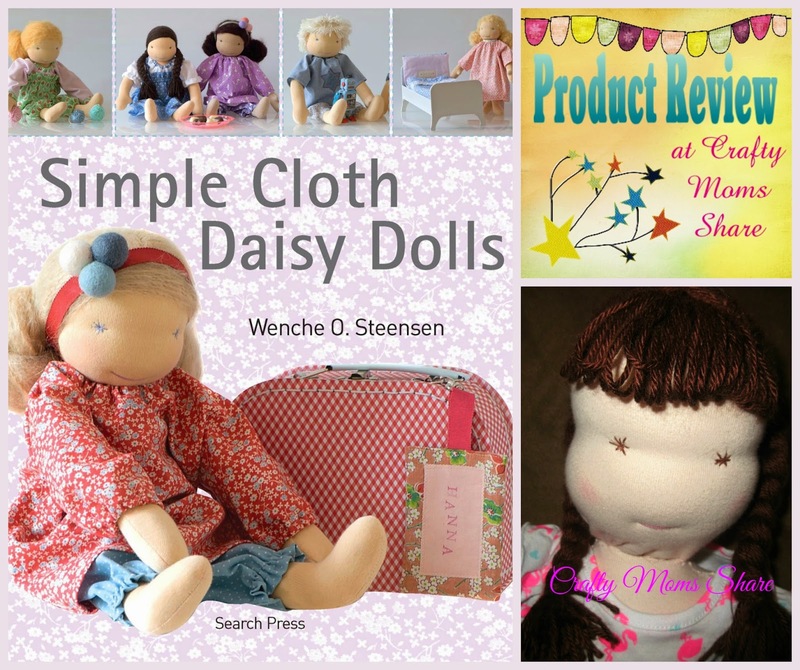 Overall I found the book very easy to follow with lots of ideas to customize your doll. I loved that the instructions are there for a girl or boy doll. I am planning on making a boy doll for a friend's son with the fabric I still have. 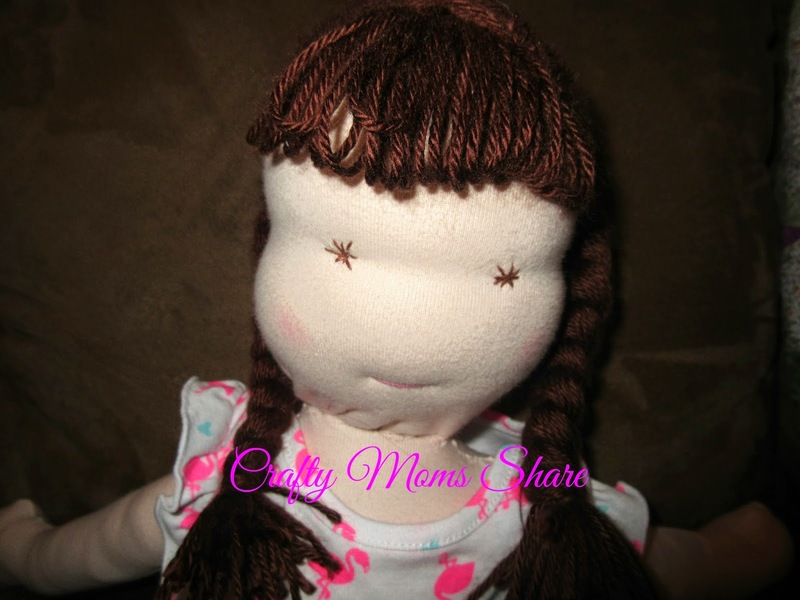 The one comment I will make is I used the boy's hair instructions to make the bangs on Hazel's doll. None of the girl dolls have bangs in the book. If you are going to use the boy hair instructions make sure you get the Errata slip (scroll down on the page). The book is missing a few steps of the instructions. I did not realize there was an Errata slip and guessed at the missing steps. It worked, but it would have been nice to have them. To make the doll you start with the head. The instructions are easy to follow and the illustrations are helpful. I really enjoyed making it. Next is the body and the limbs. The suggestions for this are again great and easy to follow. I decided to surge the seams instead of sewing them on my machine, so my curves are not perfect, but Hazel loves it. I loved the idea of stuffing from the bottom instead of the neck like I have before. This enabled me to make sure there was enough of a bottom to keep pants on her. Overall I found this book full of wonderful choices as well as good instructions. Some techniques were new to me and I found them easier than what I have done previously. I can definitely recommend this book. It is a great book for anyone who wants to make a Waldorf-like doll. I love that it comes with the pattern for the doll and the clothes. When my nephew was visiting he checked the book out since he is making a doll at his Waldorf school and needed some clothes for it. He was impressed to see the patterns as well. I chose to make stars for the eyes like the author. I found the technique for the star a bit harder than it needed to be and changed it for the second eye. However there are many options given for the shape and style of eyes. Like I said it is the perfect book for anyone who wants some choices to customize the doll. Since the book is published in the United Kingdom,the suggested places for supplies were also in the United Kingdom. I bought the fabric and matching thread at Weir Crafts where I had purchased doll making supplies previously.